Questions? Want to place an order? Call 1-800-469-1301 or 407-656-5534 and ask for Lisa. I AM SOOOOO HAPPY: I just received our bloomers from you and can't thank you enough for such a wonderful experience. They are just beautiful and I was pleasantly surprised when I found that you had left an opening for adjustments to the waist band. After adjusting the waist they are perfect. We can't wait to show off our purchases to the rest of the Red Hat Society Ladies that will be joining us on our cruise in October. Also thank you so much for the goodies you sent with the bloomers. I am going to be happy to pass around your cards that you sent. Again, thank you and hope to do more business with you in the future. Did you see our Bloomers in the DISNEY movie Enchanted ??? How many ways can YOU think of to wear your BLOOMERS? Bloomers are for any and all occasions! Do you need Clothing Labels ?? 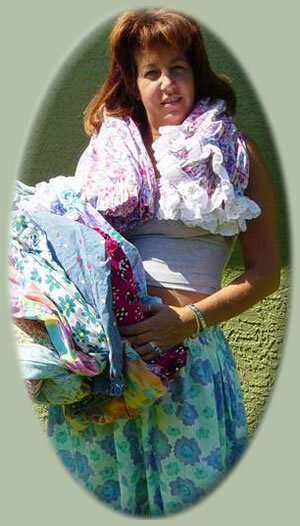 Bloomers 4U.Com was created out of my love for Victorian and Renaissance style clothing. We offer unique handmade Bloomers, Knickers, Chemises, Petticoats, Capri's and Pantaloons. We are now Offering Corsets! Renaissance and Victorian style clothing have increased in popularity because of Medieval and Civil War reenactments. Bloomers in particular have enjoyed increasing popularity and have crossed over from reenactment garments to everyday wear. Bloomers 4U.Com offers a huge selection of Bloomers for: Renaissance, Victorian, SCA, Medieval and Civil War re-enactments. We also have bloomers for Babies, Children, Bridal, Maternity, Sleepwear and even Plus Sizes. We are now offering Embroidery Designs to enhance your Bloomers. There is something here for everyone, and best of all they're affordable! If there is something you don't see in our store, let me know and we'll custom make it. PS- Bloomers make great gifts! the store pages are the upper left hand links !